A.L. Lloyd was known for this song; so, too, was Joan Baez, Ewan MacColl, and others… But amongst our sea music peers, this is a “Cliff song”. It dates to the 17th century, s among the songs collected by Samuel Pepys. 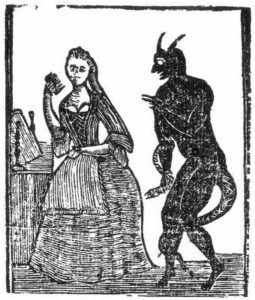 and appears in the folk tradition in myriad names such as “A Warning For Married Women”, “The Fair Maid of Bristol”, “The Demon Lover”, and even “The Distressed Ship’s Carpenter”… With as many melodies to sing them to! It tells the tale of a woman who had loved a sailor but wound up marrying a carpenter (house or ship), later to be approached by either the former lover (sailor) or the devil in the form of that former lover… In either case, he woos her away with the promise of a higher standard of living and she leaves even her infant behind… But the story turns sour and our lady finds herself facing death and thence hell. Melody as sung by Cliff Haslam. And keep me from poverty? Weep it for your golden store? Who never you shall see anymore? That rise so fair and high? Those hills so dark and low?